I have faith that one day The (real) Bolt will fly into the imaginations of people (at least 3), so I thought I'd start thinking up The Bolt's rogue's gallery. We all know that Spidey and Batman have the quintessential bad guys, so I wanted to keep on par with that kind of quality. And just today I caught that scene in Superman 3 where the infected-with-red-kryptonite Superman fought Clark Kent in the junk yard. It gave me the idea for this guy...The Dark Bolt. He's the splitting image of Mike Shelton AKA the Bolt, but he's just rooted in being bad. The difference here is that usually the hero fights to keep his true identity a secret, but in this case Mike has no chance. When The Dark Bolt was "born" he gained all of Mike's memories. 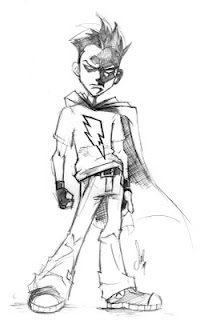 He IS essentially Mike, but with no love for anything that Mike is, including his family and friends, so Dark Bolt always keeps it personal. His face always shrouded in shadow. Furthermore, he would be more determined and focused than Mike, easily weilding his power and goes beyond Mike's strength. I think it's important that a villain be stronger than the hero and have the ability to always go one step further than him. Anyway, I'll keep developing this guy more and coming up with more bad guys.